This newspaper article, from The Evening Herald, commemorating Dr. George H. Starke (1898-1978) for his services to the community. 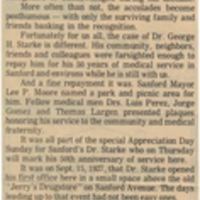 In 1971, the Sanford Mayor Lee P. Moore dedicated George Starke Park to Dr. Starke, located at 1501 West Third Street. He has also received honors from Dr. Luis Perez, Dr. Jorge Gomez, and Dr. Thomas Largen and was honored at the ""Appreciation Day Sunday" event held by the Sanford Chamber of Commerce and the Concerned Citizens Committee. Dr. Starke was a practicing medical doctor who opened his practice in Sanford, Florida, on September 15, 1927. Shortly thereafter, Dr. Starke became one of only four African-American physicians to be accepted by Harvard University for residency at Massachusetts General Hospital in Boston. He practiced for several years in Boston and then returned to Sanford in 1933 and continued to practice medicine until his death at age 80. For many years, Dr. Starke was the only African-American doctor in Sanford. Dr. Starke was also the first African-American doctor to acquire membership in the Florida Medical Association and the Seminole County Medical Association, as well as the second to join the American Medical Association. In 1971, the City of Sanford named George Starke Park, located at 1501 West Third Street, in his honor. Original newspaper article: "A Big Thanks for Dr. Starke," The Evening Herald, September 13, 1977, page 4A: Dr. George H. Starke Folder, General Henry S. Sanford Memorial Library, Sanford Museum, Sanford Florida. Digital reproduction of original newspaper article: "A Big Thanks for Dr. Starke," The Evening Herald, September 13, 1977, page 4A. Dr. George H. Starke Folder, General Henry S. Sanford Memorial Library, Sanford Museum, Sanford Florida. Originally published by The Evening Herald. Copyright to this resource is held by The Evening Herald and is provided here by RICHES of Central Florida for educational purposes only. Ward, Thomas J. Black Physicians in the Jim Crow South. Fayetteville: University of Arkansas Press, 2003. “A Big Thanks for Dr. Starke.” RICHES of Central Florida accessed April 24, 2019, https://richesmi.cah.ucf.edu/omeka/items/show/3074.